I’ve been using Beyond Compare as my tool of choice for file and folder comparison for a long time now. When I first moved to the Mac world there wasn’t a Mac-version available yet. That was a bummer. Fortunately, now there is one now. When I need to do work on a PC, I run a Windows virtual machine on my Mac using Parallels Desktop. 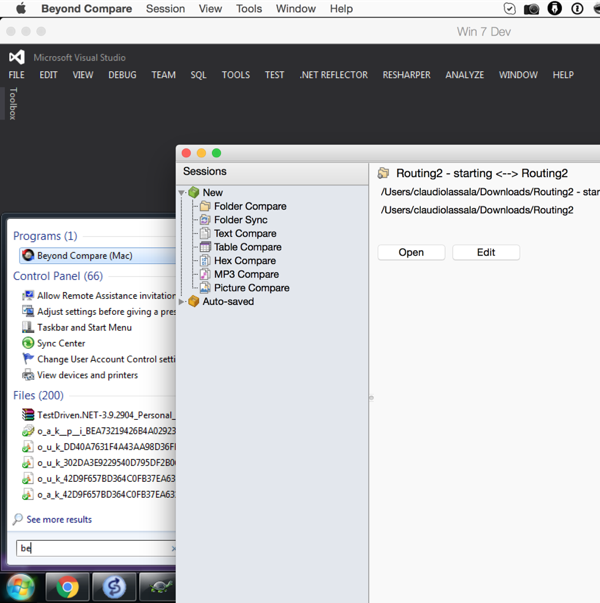 I’ve just learned recently that I can use my Beyond Compare on the Mac directly from within my Windows virtual machine (at least using Parallels). It works just like that: I invoke the comparison from inside the virtual machine, and Beyond Compare pops up on my Mac (the host). Pretty nifty! One great benefit is that I can have just one license of Beyond Compare for the Mac, instead of having licenses for both the PC and the Mac. The website is back up! We’re scheduling people to come give us a 10-30 minute talk on specific subjects, in order to get some discussions going. We’ll be publishing our schedule to some online calendar. I also shared about Rails Assets, and asked how the guys handle pulling libraries into Rails app. JB says he’s given up on using gems for that, and just puts the files into the project. I’ll probably try that, too. At least one extra screen is essential for me. Many years ago I posted about Organizing Windows and Multiple Monitors. When I migrated to using a Mac most of the time, as well as using an iPad for many things, I was happy to know there was a way to use the iPad as a secondary monitor. That to me was great because whenever I wasn’t at my normal working place (maybe traveling to clients or conferences) I always have both my Mac and my iPad with me, so I could still work in a dual-screen set up (not huge screens like I prefer, but still…). At the time I wrote up about that: Setting an iPad as an extra monitor. That approach, however, wasn’t flawless. The app I was using, Air Display, connected the Mac and the iPad through the wi-fi network. In some networks, I just couldn’t get this to work. Also, there was a noticeable lag when moving between screens. Fortunately, about a year ago I found this app: Duet Display. Life was good again. This app uses the iPad USB cable to connect to the Mac, and it has zero lag. Now I just need to get me that bigger iPad! I talked about my struggles integrating AngularJS templates into a Rails app, which boiled down to me skipping a step or two following instructions on how to use the Angular-Rails-Templates gem. I mentioned Postach.io, which is a blogging platform that allows us to maintain a blog by writing the posts as notes in Evernote. This is what I’m using for my musical blog, Sanctuary of Nevermore. For my professional blog, www.lassala.net, which is hosted on WordPress, I’ve been using a blogging tool called Blogo, which allows me to write my drafts in Evernote, and then edit the posts and publish it using this tool. Stop Thinking About It and Just Do It! I think I’ve been good at having ideas and saving them off somewhere. I’m now trying to get in a flow where I turn those ideas into something. Example: If I outline 20 ideas for articles I want to write, that’s motion. If I actually write and publish an article, that’s action. I read that post and his examples resonate with me. I went back to where I keep ideas, and sure enough I’ve been having a lot of “motion”, but not “taking action”. I decide to change that, so I picked a few ideas that seem to make me go like “yeah, I want to do that”, and started to take action on them, tracking the steps and trying to make progress. Objects in motion tend to stay in motion. Find a way to get started in less than 2 minutes. It’s not just about working hard, it’s also about working on the right things. You have a limited amount of force and where you apply it matters. Your productivity is a balance of opposing forces. If you want to be more productive, you can either power through the barriers or remove the opposing forces. The second option seems to be less stressful. I have the bad habit of starting to read several books and then taking a long time to finish (I just finished a book that I started to read 3 years ago!). I like books both in printed and electronic format. I grab them and start reading. Next thing I know, I’m reading 10 books at the same time. I put all of my digital books in PDF format in a Books notebook in Evernote. This allows to search across all of these books (a feature of Evernote). I also add one note for each print books and audiobooks I have. Read: used for books I’m done reading. I’ve been focusing on my “Books – 2-Reading” search, as I want to finish off those books (there are 11 in the list right now!). For each book I’m reading, I create a separate note named after the book’s title, and tag it with “book notes”. I then type in whatever comments I want, put snapshots of specific pages, URLs, anything else related to the book that I find I may need in the future. These notes also go into my Books notebook. I know I can annotage things on Kindle books and export my notes, but as I mentioned, I have books in Kindle format, PDF, print, audiobooks, so I decided to follow the flow described in this post for any type of book format. Signing off now. I have some reading to do!